A surging Sacramento River flows past the former site of the seasonal bridge. It was recently reported that the Lake Siskiyou Trail’s seasonal bridges over the Sacramento River at the lake’s inlet had been installed. This was earlier in the year than normal and it appears that the installation may have been premature. At some point in the last couple weeks the water level rose high enough that it dramatically reshaped the landscape at the lake’s inlet and the river’s course has been altered. 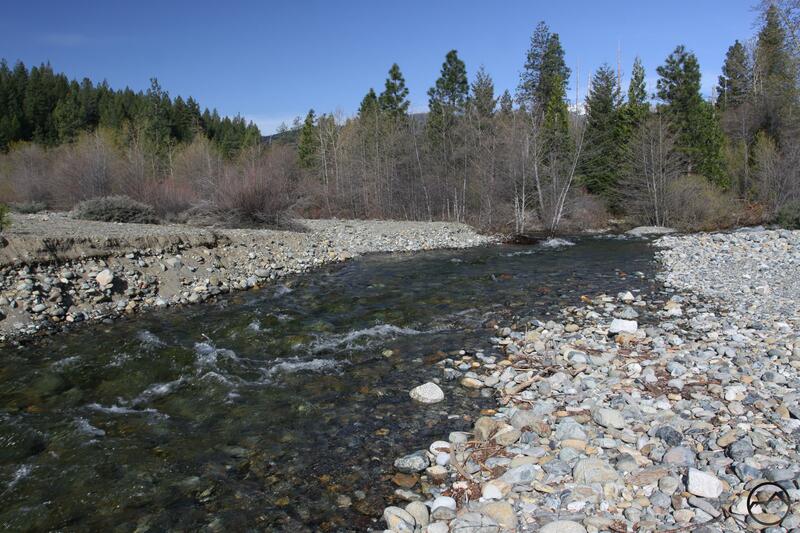 Channels that once carried overflow water or ran dry are not the main path of the river as it hurtles swiftly toward Lake Siskiyou. 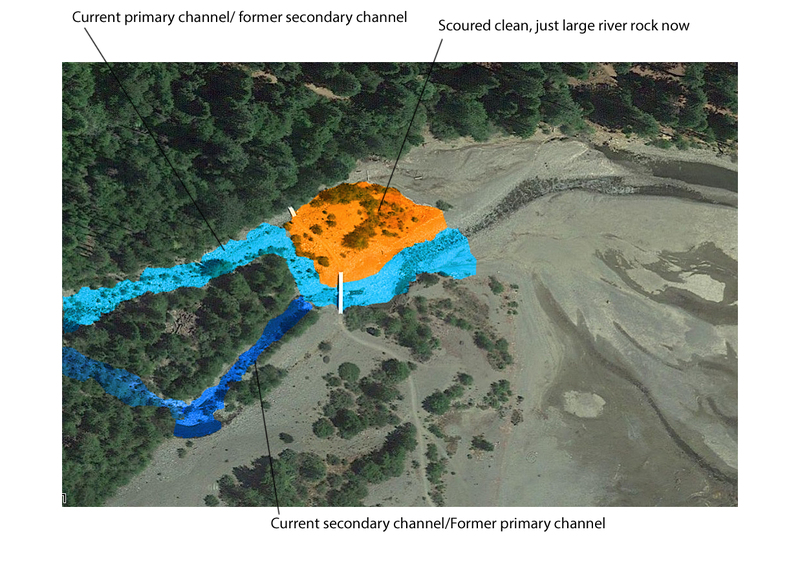 Areas that were once covered in trees and brush have been scoured clear, leaving only an expanse of large river rocks. That this happens is not entirely surprising. The evidence that the river has changed its course in the past is visible in the dry, rocky channels and in the layers of rock and sediment visible in places where the river has cut away small slopes. The affected area. 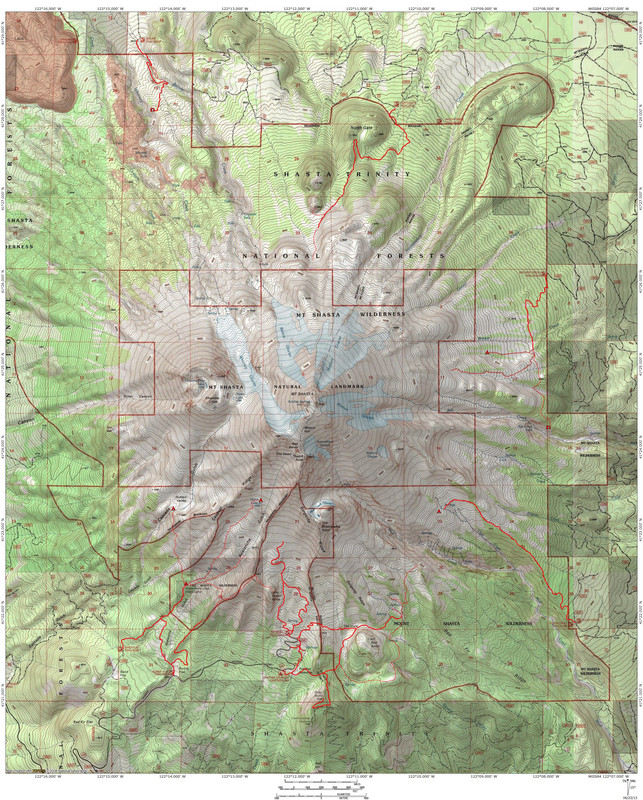 The image was made when Lake Siskiyou was drawn down. Most of the sandy area on the right is inundated. One of the most dramatic results of this most recent rearrangement of the Lake Siskiyou inlet area is the apparent destruction of the seasonal bridges that complete the loop around the lake. When approaching from the north shore, the first indication of the damage is a large wooden bridge over what is normally a very small stream. The bridge is visible 10 to 15 yards away from where it should be, washed away by what must have been a furious torrent. Beyond the stream is another, wider creek. This would normally be the location of the first of the three seasonal bridges. Not only is the bridge gone but the wire cages filled with river rock, structures that served as foundation piers for the bridges, are completely gone. Crossing this creek without wet feet requires some tricky maneuvering but once across, the fullness of how much has changed is evident. Any trace of the old trail, the second, larger bridge, and most of the vegetation that flanked the lake’s inlet are all gone. All that remains is a large, rocky area and the swift moving Sacramento River. The washed out wooden bridge. What was once a dry channel now houses the Sacramento River. The rerouted river intersects the old river channel. I had no idea the bridge and the portion of the Lake Siskiyou Trail around inlet had been wiped out when I took my kids there this morning. I had planned on letting them float sticks down the river and throw rocks. It was a surprise to find the wooden bridge dislodged and the metal bridges non-existent. Nonetheless, once I got my son and daughter across the smaller creeks, they had an excellent time along the river, with or without the bridges. Given the drought conditions, this kind of damage may come as a bit of a surprise. However, there has been more precipitation this winter than it seems. While the damage is unfortunate, it is heartening to know that so much water has been poured out on the Mount Shasta area. Hopefully the spans will be rebuilt soon and the Lake Siskiyou Trail will be enjoyed throughout the coming summer. I love this site. Keep up the good work. I find it interesting and informative, and it encourages me to get out there and explore.